There are 24 million children (1 in 3) who will go to sleep tonight in homes in which their fathers do not live. That's a staggering number. But the problem of father absence doesn't only affect those 24 million children. It also affects the children living with fathers who are spiritually and emotionally absent from their children's lives. Research shows that children with absent fathers are more likely than their peers growing up with their fathers to suffer from a range of ills, such as poverty, poor school performance, drug and alcohol abuse, and the list goes on. But, once again, it's not just physical absence or presence that makes a difference. Children who live with fathers who are but a mere presence in their homes suffer as well. The level of involvement matters; for example, a landmark study by the U.S. Department of Education found that children whose fathers are more involved in their education have better grades than fathers who are involved in their education to a lesser degree. The costs of father absence matter, a lot. These costs have a name -- opportunity costs. An opportunity cost is any cost that results from a person's decision to do something instead of something else. From another perspective, it's the benefit a person sacrifices to do something else. When fathers are absent from their children's lives -- physically, emotionally, or spiritually -- it costs them dearly. They give up the benefits of being involved, responsible, committed dads -- such as the love of their children and the joy of seeing their children grow into adults -- and the benefits of mothers' love in raising children together. To be fair, there are some rare instances of father absence in which fathers don't choose to be absent. Fathers' levels of involvement must also be understood within the context of how they provide for their family. A father, for example, who must work two jobs to support his family has only so much bandwidth to be physically present. The vast majority of instances of father absence, however, involve fathers who choose to do something other than be present -- to be somewhere else physically or in their minds than where they should be. What makes father absence as a choice so incredibly heinous are the opportunity costs of it for children, the mothers left to care for absent fathers' children on their own, and our society. If the costs only accrued to absent fathers, the National Fatherhood Initiative wouldn't exist. But the costs don't only accrue to these fathers. Like the ripples that result from the rocks fathers and children throw into and skip across ponds, the impact of father absence is felt far and wide. Children, mothers, and our society need involved fathers. We can't spare a single one. To all those fathers who have made a choice to be absent, I implore you to reverse course. Think about the opportunity costs to you. More importantly, think about the opportunity costs of your choice to your children, the mother of your children, and our society. The costs of father absence is high. 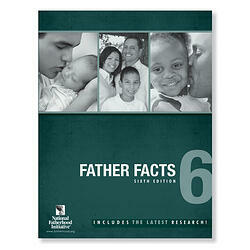 Visit our Father Facts Page to learn more and support NFI’s work to connect father to child.